To create a Pajek file, download and use this ODS spreadsheet document here. Open the ODS spreadsheet, with LibreOffice  and activate the macro element. Important: To do this, you must be running JRE  on your system. After modifying the spreadsheet, you can export the file as Pajek file. It is also possible to open and modify a Pajek file with a text editor, but it is much simpler to use the recommended spreadsheet. The keyword "*Vertices [number of nodes]" is the starting point for the nodes section. New nodes and references to existing nodes can be defined. Available formats appear below. Note: when using a Demographic Population Model in STEM you need only declare the main population name e.g. human in the list of nodes. You can refer to individual population subgroups (e.g., men, women) when declaring the populationID for the edges. 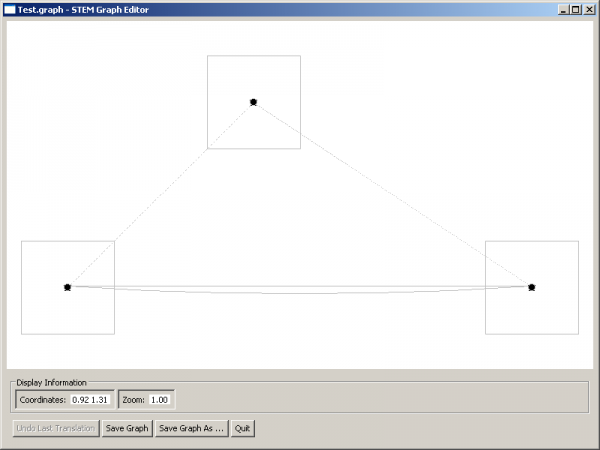 Note: the optional parameters are not automatically implemented when you use the pajek graph in STEM. They are all specified in a single trigger which will be located in the "Triggers" folder of your project. The name of the trigger usually starts with "List platform:/resource" and ends with the name of your pajek graph. The trigger must be dragged into your scenario in order for the optional parameters to be implemented. Use Absolute Migration Rates- If selecting “yes” then the rate will be the exact number of individuals that are moving across migration edges. If selecting “no”, then a rate from 0-1 must be specified to move a proportion of individuals across the migration edge. Note that if a stochastic solver is used, then this will be a probability of movements, rather than an exact proportion. 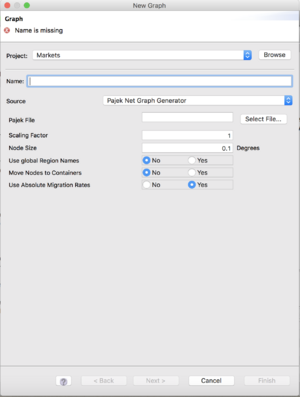 A tutorial on how to import a Pajek graph that contains discrete migration events for a STEM graph is available at Import Discrete Transportation Events. Discrete events can be used to model commodity flows, e.g., the transportation of beef from slaughterhouses to supermarkets in order to model the spread of a foodborne disease. If you get an “out of bounds” exception, then it is likely that the numbers in your nodes do not match those used in your edges. If you are using data from an Excel spreadsheet and copying into the Libre Office spreadsheet, make sure you choose “paste special” > “unformatted code” > “unitext”. This page was last modified 17:47, 18 October 2018 by Judy Douglas. Based on work by Emily Nixon, Taras Guenther and Christian Thoens and others.